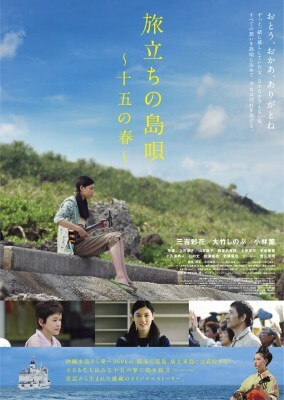 Junior high school student Yuna lives with her father on the Okinawan island of Minami-Daito, population 1,200. Because the island is too small to support a high school, students typically move to Okinawa to continue their studies. We meet Yuna during her last year on the island- her older brother and sister have already settled in Okinawa, and her mother, who left to accompany her then-teenager daughter, has chosen to stay there as well. At the end of the year, Yuna will lead the student folk music ensemble in playing the traditional farewell song, Abayoi. As Yuna prepares to leave her father and her tight-knit community, she becomes penpals with a handsome student on another island, while becoming aware of rifts in her own family’s relationships.